The price differential between WTI and Brent has suddenly narrowed, putting the U.S. export boom at risk. For much of last year, the two crude oil benchmarks traced one another pretty closely, with Brent often trading at a relatively minor $1 to $3 per barrel premium to its American counterpart. But the spread between the two blew out after Hurricane Harvey, an event that took several million barrels per day of refining capacity offline for a few weeks. Crude oil piled up into storage, and the glut pushed the WTI benchmark down relative to Brent. The refineries along the Gulf Coast returned to operations within a relatively short period of time, but the effects of the disaster lingered. The differential hit a peak at over $8 per barrel in late September, but still traded at elevated levels for the rest of 2017. But the WTI-Brent differential has narrowed sharply over the past month, falling from over $7 per barrel in December to under $4 per barrel in recent days. Why? Part of the reason is precisely because of the buying spree that took place in the latter half of 2017. High levels of exports helped the U.S. Gulf Coast work off much of the excess. Inventories declined at a rapid pace in the last few months of 2017, bringing them down much closer to five-year average levels (the main objective of the OPEC cuts). Because that surplus has been largely drained — with the help of elevated exports — the discount for WTI had to narrow. In essence, the export machine, which was driven by the large differential, ate away at that discount. 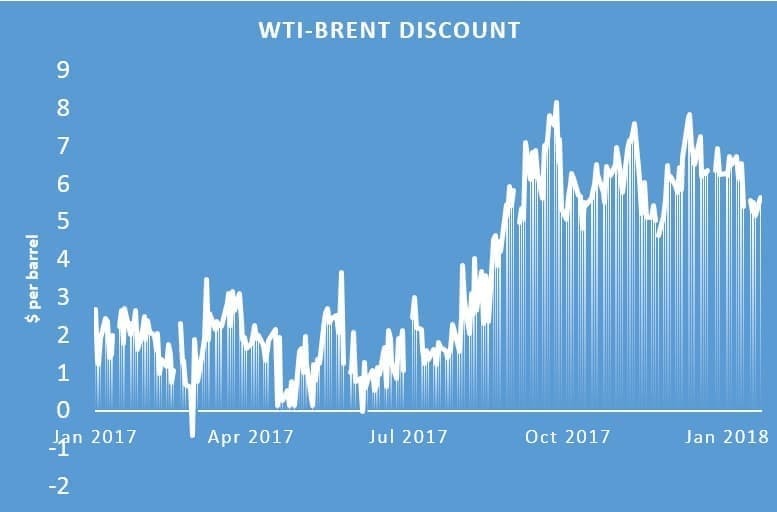 Tom Kloza, global head of energy analysis at Oil Price Information Service, predicts the WTI-Brent discount to average about $4 per barrel over the next year. The other factor that will continue to drive a wedge between the two key crude benchmarks is U.S. shale production. Total U.S. output is expected to surpass 10 million barrels per day pretty much at any moment, while averaging 10.3 mb/d for the year. The EIA sees that figure shooting up to 11 mb/d by the end of 2019. The recent sharp rise in the rig count also added fuel to speculation about an acceleration in shale drilling. For the week ending on January 26, the U.S. saw a net gain in the oil rig count by 12 compared to the week before. But that figure obscures the fact that the Permian basin saw an increase of 18 rigs for the week, slightly offset by declines elsewhere. In other words, the Permian, where much of the shale action is happening these days, is firing on all cylinders. The rush of new supply is expected to lead to gains in inventories of much of the first two quarters of 2018. That will weigh on crude prices generally, but also WTI specifically, preventing the benchmark price from converging too closely towards Brent anytime soon. Have Oil Prices Hit A Ceiling? With all due respect to the author's work, I must say he ignores another important factor why other nations import US crude - simply the growth of local demand while OPEC is aggressively cutting production. It is just too simplistic to assume the widening spread between WTI and Brent will have any major negative impact on US crude export, only a weakening global economy and sudden decline of demand will kill the US export, while a strengthening global economy and rising demand for crude will further tighten US crude market, then, we will start to talk about whether US can produce enough Crude to meet the export demand soon.